The Pontevedra apparitions are the Marian apparitions that Sister Lúcia, the Portuguese visionary of Our Lady of Fátima, reported receiving while living in a Dorothean convent in Spain. Dorothean convent in Pontevedra, now known as the Sanctuary of the Apparitions, in which Sister Lúcia lived and received Marian apparitions. Eight years after the Fátima events the last surviving seer, now Sister Lúcia, was living in a Dorothean convent in Pontevedra, Spain. 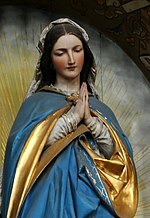 At this point, the Virgin Mary is said to have set the parameters of the Five First Saturdays devotion. If one fulfilled these conditions on the First Saturday of five consecutive months, the Virgin Mary promised special graces at the hour of death. The First Saturdays devotion had already been an established custom in the Catholic Church. On July 1, 1905, Pope Pius X approved and granted indulgences for the practice of the first Saturdays of twelve consecutive months in honor of the Immaculate Conception. This apparition at Pontevedra requesting the establishment of the devotion of the Five First Saturdays is reminiscent of the apparitions reported by Saint Margaret Mary Alacoque in the 17th century which led to the establishment of the First Friday Devotion. Some devotees of Our Lady of Fatima believe the devotion of the Communion of Reparation on the Five First Saturdays, is an important part of the Message of Fátima. Later, Sister Lúcia reported that on February 15, 1926 while emptying a garbage can outside the garden, she saw a child she thought she recognized. After striking up a conversation with him, the child transformed into the Child Jesus, who then reprimanded Sister Lúcia for not doing more to promote the five First Saturdays devotion. This page was last edited on 27 January 2019, at 04:30 (UTC).